Trips are made in both canoe and kayak on this route. We also offer this trip as a self guided tour by canoe or kayak, to individuals and groups with some experience. The journey starts in the hamlet of Elphin. We will pack our boats either canoes or kayaks, for expedition, being completely self sufficient on our journey. 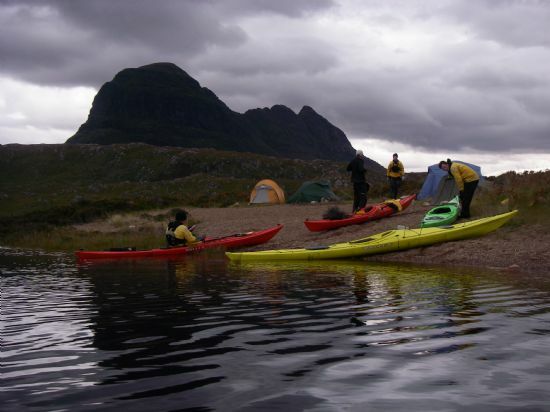 There will be time to get to grips with our boats before we paddle into the heart of Loch Veyatie and loch Fionn, with the magnificent mountain of Suilven emerging before our eyes; this is one of the most pristine wilderness areas in Scotland. The next day we have the option to ascend Suilven, by far the best way to climb this magnificent mountain or/and the journey then has two options to retrace our paddles or to 'portage' our boats into Loch Sionascaig. If time allows us this is a great option and sees us set up camp on a beautiful island surrounded by the sandstone peaks of Cul Mor, Cul Beag and Stac Pollaidh. There will be plenty of exploring time on this trip, time to fish for trout from your boat and time to take in the awe inspiring views of the wilderness of Coigach & Assynt. If you are after a true wilderness experience where you will be amongst nature at its best then this is the trip for you. A love for the outdoors and a want to escape into this beautiful wilderness is the only experience necessary for this trip.